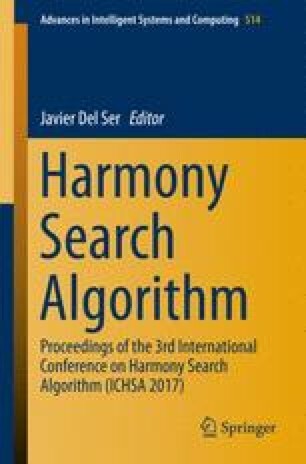 This paper explores the feasibility of a particular implementation of a Grouping Harmony Search (GHS) algorithm to assign resources (codes, aggregate capacity, power) to users in Wide-band Code Division Multiple Access (WCDMA) networks. We use a problem formulation that takes into account a detailed modeling of loads factors, including all the interference terms, which strongly depend on the assignment to be done. The GHS algorithm aims at minimizing a weighted cost function, which is composed of not only the detailed load factors but also resource utilization ratios (for aggregate capacity, codes, power), and the fraction of users without service. The proposed GHS is based on a particular encoding scheme (suitable for the problem formulation) and tailored Harmony Memory Considering Rate and Pitch Adjusting Rate processes. The experimental work shows that the proposed GHS algorithm exhibits a superior performance than that of the conventional approach, which minimizes only the load factors. This work has been partially supported by projects TIN2014-54583-C2-2-R (Spanish Ministerial Commission of Science and Technology) and S2013ICE-2933_02 (Comunidad Autónoma de Madrid).